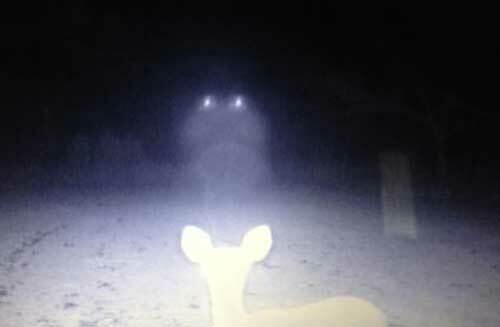 A Mississippi couple are mystified by what looks like a UFO caught on their trail cameras. Expecting to find a few night bugs, Edith and Rainer Shattles were shocked to discover footage of eerie lights hovering above the trees. The couple said that the unusual bright lights were recorded on their infra-red trail cameras. "We have unusual things happen around here that happen, but it's usually associated with our grandchildren. But this case, we didn't know what it was," Edith recalled. "I was looking for a nice buck to be showing up on the trail camera actually." The video starts with a deer in a clearing and then a few minutes later the lights appear. The source of the lights are a mystery as they sat too high up to be headlights from a car and no paved road goes through the road where the camera is placed. That news anchorman would put me to sleep. Something strange about him. Yes, and he pronounced February wrong. Wonder why they didn't show the actual clip, only showing a few still shots indicates some trickery may be afoot. Of course, that is me presuming that is was a video recording. As an aside, I have often wondered why an off world species, able to devise propulsion of such fantasticness that they can travel here, has to rely on headlights ! And if they are bound by having to use our visible spectrum, why do they have to have two headlights ? I always assumed that that was what we had as we had need to mark how wide our vehicles were, for the sake of oncoming vehicles. Maybe it is the same on Mars.